Used Kodak Utility Darkroom Safelight Model D.
The Kodak Utility Safelight Lamp Model D has been a familiar fixture in commercial and institutional darkrooms for decades. It accepts 10" x 12" filters and is designed to be hung from the ceiling to provide direct or indirect illumination in larger areas. Filters of various specifications are available to accommodate the requirements of different photo materials - refer to the product data sheet packed with the material you are using to determine the recommended safelight filter for that specific material. The Model D safelight accepts 25W, 15W, or 7½W bulbs, depending on the requirements of the filter and material being used. For optimum convenience, it is recommended that the safelight be connected to a grounded outlet with remote switch control. These safelights are used and have minor cosmetic scrapes and scuffs, but are clean, complete, and certified to be in in perfect working condition. 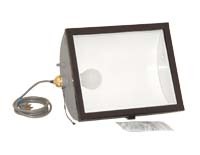 Each safelight includes a standard 25W 130V frosted lamp, support chains, 6-foot 3-wire grounded cord, and a copy of the Kodak publication "How To Use Kodak Safelights".